I came across your site by randomly clicking through blogs that discuss renovating and styling post-WWII houses. When I arrived at your site, I found a wonderful source for information and inspiration! My husband and I are teachers and we just purchased our first home. It’s a post WWII cottage that was maintained by the original owners until they passed away. When we bought the house from the owner’s children, we were sure that we wanted to keep the integrity, charm and style of the house. As an added perk, the children threw in nearly all of the 1940s – 1970s furniture. That brings us to the design dilemma. 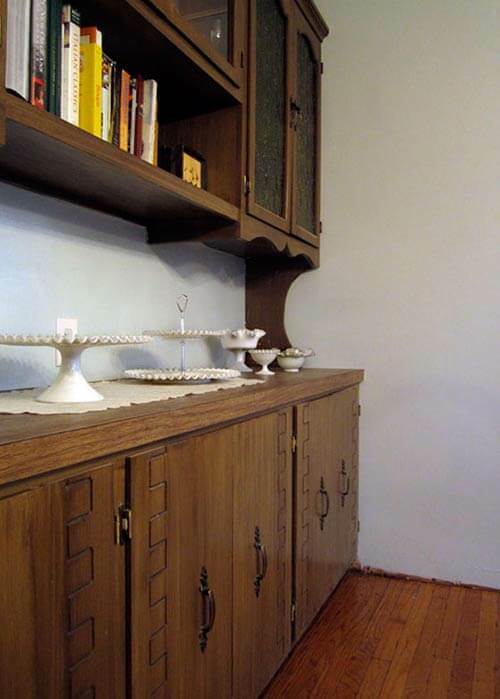 Included in these bonus pieces is a really cool built-in hutch/buffet. It’s at least nine feet long and has these really cool yellow/green plastic panels. I really like it’s functionality and form. The top of it is brown woodgrain laminate, which is super helpful when you are using the buffet to serve food because once the guests have left, it’s a simple spray and wipe cleanup with no lasting damage to the piece. The only problem is that it is painted with a faux wood grained pattern that is peeling, and has blotches of different paints all over it. The laminate is starting to peel off as well. I don’t mind that it’s brown but that particular shade looks kind of wacky with the super cool table that we received with the house. The table and chairs are in the Hepplewhite style and they are a rich mahogany brown. The walls in the room are a blue grey color, which accents the paintings and the peacock blue curtains. I’m leaning on painting the hutch, but I have no idea what color I should choose. The panels are yellow green, the table is mahogany, the paintings are blue, the walls are grey and the wood floors are red oak. 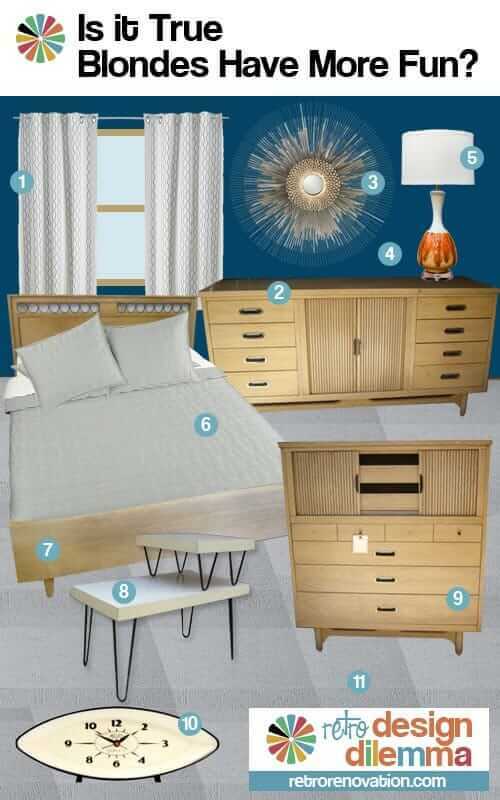 I really want to try to keep the room in the 1940s-1950s design aesthetic, but leaning towards a cottage style. If you all have any tips, I’d be really grateful. P.S. We haven’t added the molding to the room yet, because it is being repaired. It will be painted white when it’s done, though. Kami — that’s a tall order. Blending so many styles can be tricky. One trick to use when making an eclectic grouping of decor look less chaotic and more intentional is repetition of colors and shapes. I know the obvious thought for the built-in might be to paint it white, but before you decide to pull the trigger on the white paint, consider trying to repeat the color of your wood dining table — the deep mahogany — on the built-in. Rustoleum makes a product called cabinet transformations that Pam has mentioned several times here on the blog before. 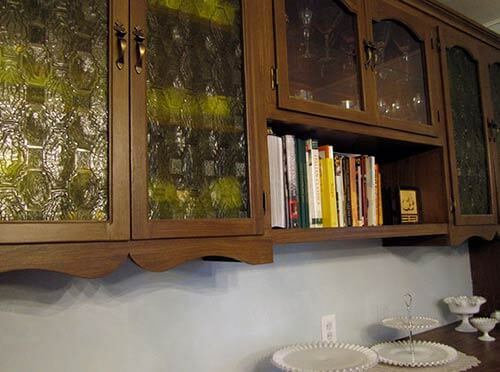 They have an extensive range of colors available — surely one would match your table — and the cabinet transformations system can be used over laminate. I think making the built-in cabinet match the dining set would help unify the room and balance the darkness of the wood around the room. Adding a large rug under the table — like this one from Albert & Dash — would help make the space look more finished and add a medium color tone to the room — bridging the gap between light walls and dark wood. We chose this hooked rug style because you said you wanted to evoke a cottage design; you could also use a braided rug.If you are being very budget conscious — shop vintage and at estate sales… Pam says she sees rugs in both these styles — large vintage ones — very inexpensively priced where she lives at estate sales and thrift stores. In reality, the colors in your rug help set the colors for the entire room. Just make sure whatever colors you choose don’t clash with the mahogany — I would probably stick with blues, greens, yellows — which allow the reddish mahogany to stand out — instead of rugs that are predominately red or orange. The mahogany already has a warm red tone — adding too much more red to the room could make it feel too intense. The pattern in the rug also evokes of the shapes in the yellow plastic panes of the hutch in addition to the decorative grooves on the lower doors and even the shapes of the chairs in the dining set. 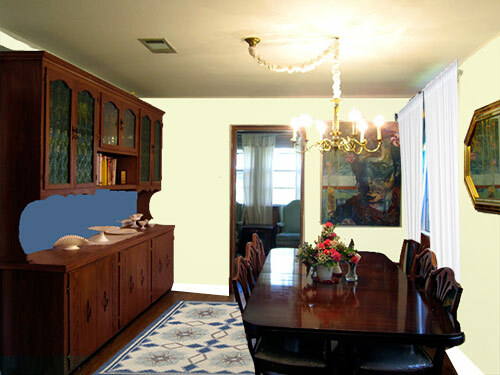 The cottage blue color we chose of the rug complements the artwork. Painting the small piece of wall between the upper and lower parts of the cabinet the same cottage blue color as the rug would help carry the color around the room as well as provide a high contrast backdrop for the lovely white dishes that Kami has displayed on the hutch — really allowing them to pop. Instead of keeping the walls light grey, I suggest painting them a pale lemony yellow to echo the yellow plastic door inserts in the hutch and the gold accents around the room. The yellow also brightens up the room, helping to achieve a lighter and more airy cottage feel. Once the white moulding is installed, it will feel much more crisp. To finish off the room — especially if you want to reinforce the cottage feel — you could swap out the peacock blue curtains for fresh and airy looking white curtains. However, the peacock blue curtains would still work with this color scheme if you end up liking the more formal look. It is possible to successfully blend varying styles and decades together in one room — through the repetition of color and shape — like I’ve done above. 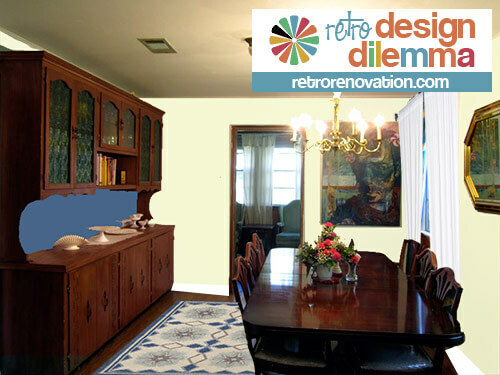 Repeating the same colors (mahogany wood tone, white, yellow and cottage blue) evenly throughout the room helps make the room feel cohesive, while the repetition of similar geometric shapes (rug pattern, chair back, hutch doors — even the mirror) adds interest and further unity to the room’s design. 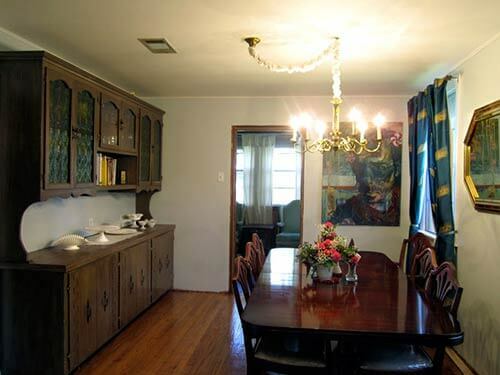 What would you suggest to help Kami unify her dining room? 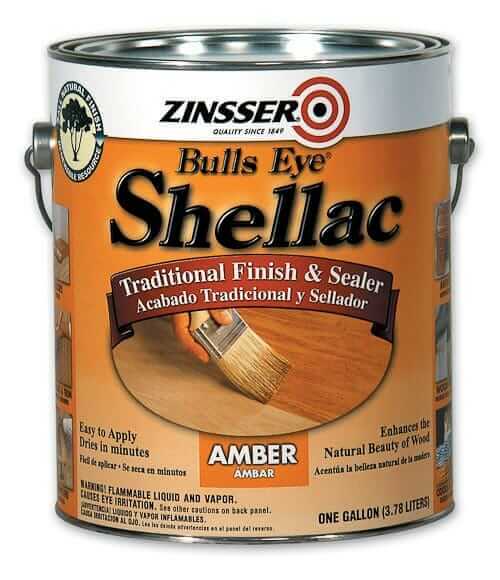 Amber Shellac: The classic finish for knotty pine — made from bug poop! I feel like I’ve already watched the debates just reading these ideas! If you love the green inserts, keep them. Paint the room the contemporary version of avocado: apple, pear or citron, in a lighter/muted tone…any softer green that works with the inserts. Paint the hutch a richer version of that color, to harmonize with the green inserts. I like the idea of chalk paints (not chalkboard paint!) because they distress nicely. 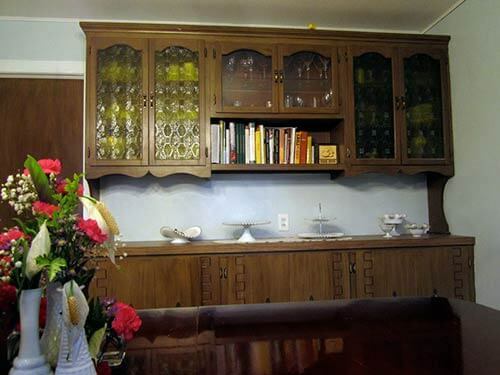 Update the hutch hardware and buffet surface as desired: wood laminates are still made, so maybe have it re-laminated to match the table. Update the light fixture with paint or with a new fixture as desired. Find yourself a rug you like (with some green in it) and with accent colors you love (blues and aquas or aqua and coral maybe??). Use simple white or cream draperies (Ikea! 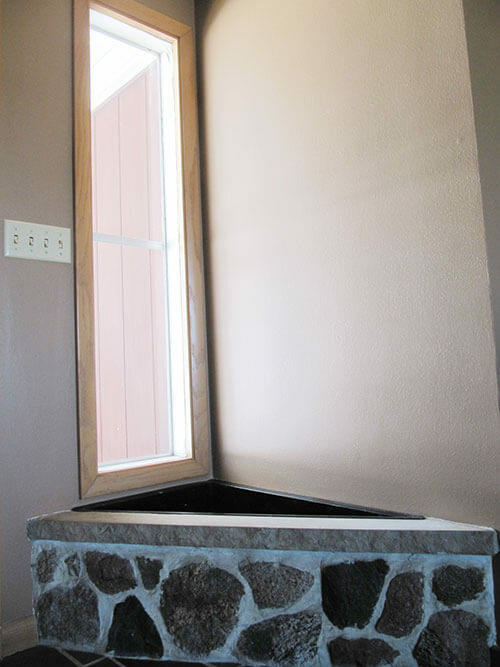 ), maybe with an edge trim or panel in one of the accent colors. Just keep the trim in the room simple white, which I assume will carry through the house eventually. If you can part with the inserts, swap them out for something clear, crackled or frosted and repeat the same idea above with blues or with warm golds, or…well you get the idea.